A research team working at the Department of Energy’s Lawrence Berkeley National Laboratory (Berkeley Lab) and the Hebrew University of Jerusalem in Israel confirmed with a unique infrared probe that jagged surfaces and defects found at the edges of nanosized platinum and gold particles are significant hot spots for chemical reactivity. Such experiments should help researchers to customize the structural properties of catalysts in order to make them more effective in promoting chemical reactions. The Jan 11th issue of the journal Nature published this study, which is a significant step in chronicling how the atomic structure of nanoparticles causes an impact on their function as catalysts in chemical reactions. Catalysts, which play a vital role in the production of several industrial products, such as plastics, fuel, and fertilizers, are materials that are capable of speeding up chemical reactions and increasing their efficiency while continuing to be unchanged in the process. Scientists are aware of the fact that materials can act differently at the nanoscale when compared to the way they behave in larger quantities, and customizing their shape and size will result in improving their properties for particular purposes. This new method highlighted the areas on single metallic particles, which measure about 100 nanometers (100 billionths of a meter), that are extremely active in chemical reactions. 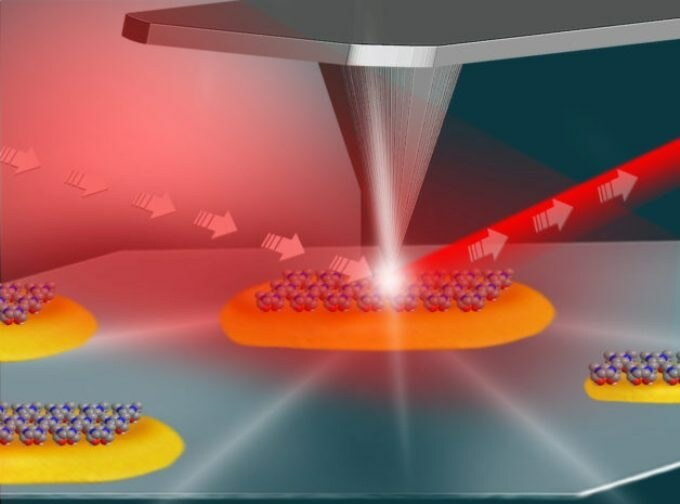 A broad spectrum of infrared light, developed by Berkeley Lab’s Advanced Light Source (ALS), was combined with an atomic force microscope in order to reveal varied levels of chemical reactivity at the edges of single platinum and gold nanoparticles compared to their flat, smooth surfaces. The team used a unique capability at ALS, dubbed SINS (synchrotron-radiation-based infrared nanospectroscopy), to study the detailed chemistry occurring on the surface of the particles. Resolution down to 25 nanometers was achieved. It allows you to see all of this interplay in chemistry. That’s what makes this special. As part of the experiment, the team coated the metallic particles with a layer of reactive molecules and then focused the ALS-produced infrared light onto the small tip (25 nanometers in its diameter) of the atomic force microscope. When combined with the highly focused infrared light, this tip functioned like an extremely sensitive antenna in order to map the surface structure of individual nanoparticles while simultaneously delivering their detailed surface chemistry. “We were able to see the exact fingerprint of molecules on the surface of the particles and validate a well-known hypothesis in the field of catalysis,” said Elad Gross, a faculty member at the Institute of Chemistry and the Center for Nanoscience and Nanotechnology at the Hebrew University of Jerusalem, who headed the study together with F. Dean Toste, a faculty scientist in the Chemical Sciences Division at Berkeley Lab and professor in UC Berkeley’s Department of Chemistry. Understanding the precise energy level that is required for triggering chemical reactions (the activation energy) is vital in optimizing reactions, and can also decrease costs at the industrial scale by conserving energy use. This technique has the ability to tell you not only where and when a reaction occurred, but also to determine the activation energy for the reaction at different sites. What you have here is a tool that can address fundamental questions in catalysis research. We showed that areas which are highly defective at the atomic level are more active than smooth surfaces. Gross noted that this characteristic relates to the small size of the particles. “As the particle size is decreased, the structure is less uniform and you have more defects,” he said. Particles that are smaller in size have higher surface area per particle than larger particles, highlighting the fact that an increased amount of atoms will be detected at the edges. Atoms found at the edges of the particles have less neighbors than those present along its smooth surfaces. Fewer neighbors refer to more freedom to take part in chemistry with other elements. As the studied chemical reactions take place extremely fast, in less than a second, and the ALS technique can take almost 20 minutes to scan just one spot on a particle, the team used a layer of chemically active molecules, which were fixed to the particle’s surface, as markers for the catalytic reactivity. The catalytic reaction in research was corresponding to what occurs in the catalytic converters of gasoline-powered vehicles. Catalytic converters convert car exhaust into less-toxic emissions by using platinum particles and other materials. Researchers stated that experiments to be performed in the future using the SINS technique will concentrate on documenting active chemical processes that use controlled flows of liquids or gases to trigger reactions. Varying temperature and pressure may be used by these experiments to gauge effects. I think this is going to be a very interesting tool for further experiments and analyses that can answer a lot of questions that couldn’t be answered before. This tool gives us the capability to get better resolution by three orders of magnitude than some other techniques, which has opened a very wide field for catalysis and surface-chemistry studies. Additionally, future studies could possibly combine infrared and X-ray-based methods at the ALS to collect richer chemical information, researchers said. Plans already exist for a new infrared beamline at the ALS that will focus on increasing the capacity and capabilities for infrared chemical studies and also introducing infrared-based 3-D structural studies at the ALS. The ALS is a DOE Office of Science User Facility. This study was supported by the DOE Office of Science.